An important step in maintaining a healthy smile is to replace missing teeth. When teeth are missing, the remaining teeth can change position, drifting into the surrounding space. Teeth that are out of position can damage tissues in the mouth. In addition, it may be difficult to thoroughly clean between crooked teeth. As a result, you run the risk of tooth decay and periodontal (gum) disease, which can lead to the loss of additional teeth. A Partial Denture or "removable bridge" replaces one or more missing teeth, but there must be teeth remaining for the partial to attach to. Unlike a Fixed Bridge, a partial is removable. A partial will prevent other teeth from shifting, preserving your remaining teeth. A removable partial denture fills in the space created by missing teeth and fills out your smile. A Valplast Nesbit replaces 1 to 2 teeth and contains no metal,. Instead it has flexible gum colored arms. Patients prefer them to bridges because they are less costly than fixed bridges and adjacent teeth do not have to be cut down. 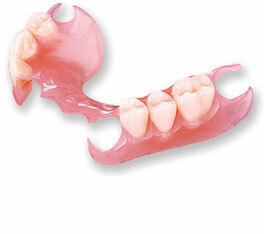 Today's dentures are comfortable, natural in appearance and functional.